I love Chinese food just as much as the next person, but I always feel awful after I eat it. Chinese food is also, in my opinion, the hardest thing to try to make at home. After many failed attempts, I finally quit trying a couple of years ago. I decided it was a treat I could indulge in once in a while and that I would leave it to the professionals when I did. Until now, that is. 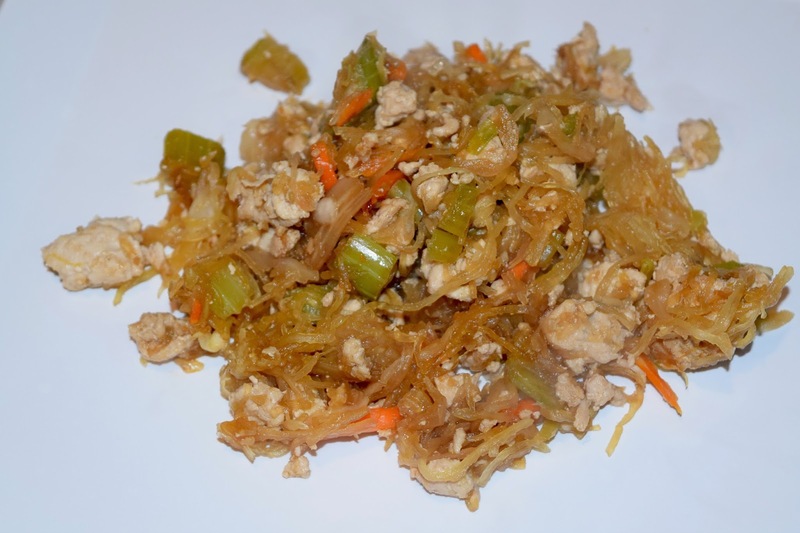 I stumbled upon this recipe for Spaghetti Squash Chow Mein and decided to give it a shot. I had such low expectations that I didn't even take pictures before I served it, something I typically do with a new recipe in case it's "blog worthy". However, after I took a bite, I quickly snapped a few pictures because I knew I wanted to share. This is one of those meals that you feel great about eating. I mean really, really great. It's basically straight vegetables! The original recipe was vegetarian, but I added in lean ground turkey for some added protein (and to appease the husband). You could easily use chicken or ground beef or go the vegetarian route. Either way, this recipe has an authentic Chinese taste thanks to the ginger and is one of the healthiest dishes you could make. 1. Preheat oven to 400 degrees and fill a 9x13 pyrex pan with 1/2 inch of water. 2. Cut a spaghetti squash length wise and scoop out the seeds. Lay skin side up in your pyrex pan. 3. Bake spaghetti squash for 30-40 minutes or until the flesh is very tender. Once done, scoop out the flesh with a fork so it breaks apart into strings and set aside. 4. Meanwhile, whisk together soy sauce, garlic, brown sugar, and ginger and set aside. 5. In a large pan over medium high heat, add olive oil and brown your ground turkey. Add in onion and celery and stir often, cooking until tender, about 3-4 minutes. Stir in cabbage and heat another minute. 6. 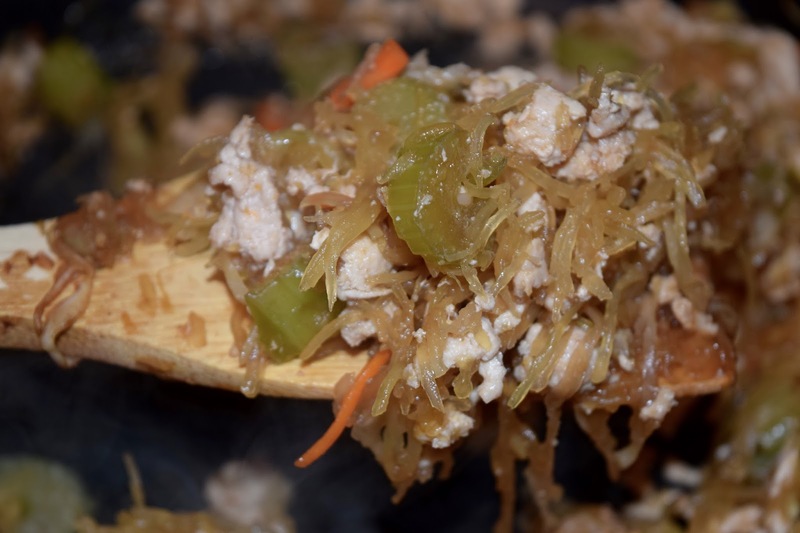 Stir in your soy sauce mixture and spaghetti squash until well combined, about 2 minutes. Serve immediately. 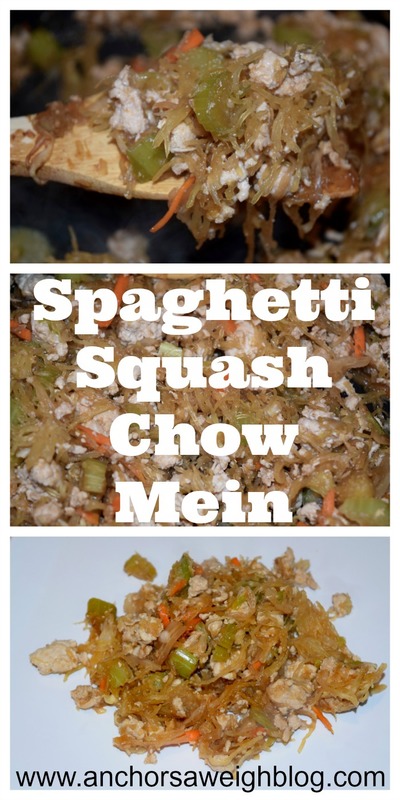 i've tried spaghetti squash and have failed but i like this recipe! This recipe just may get me to try spaghetti squash, it sounds amazing! I thought about you yesterday when I was making Crockpot "baked" ziti. It would make the perfect blog recipe, and it was so simple to make! I'm afraid of spaghetti squash! Does it taste like regular squash?? Are the seeds the little noodle like things you eat or are there other seeds that you take out and discard? I would have no idea how to use one if I even wanted to try, haha. Made this tonight! It turned out so well! Thanks for sharing, I've been looking for something new to do with spaghetti squash!